A Monk’s Cross at Subiaco Abbey. It was misting the day I walked this hillside cemetery beholding priests’ graves at Subiaco Abbey in Subiaco, Arkansas. 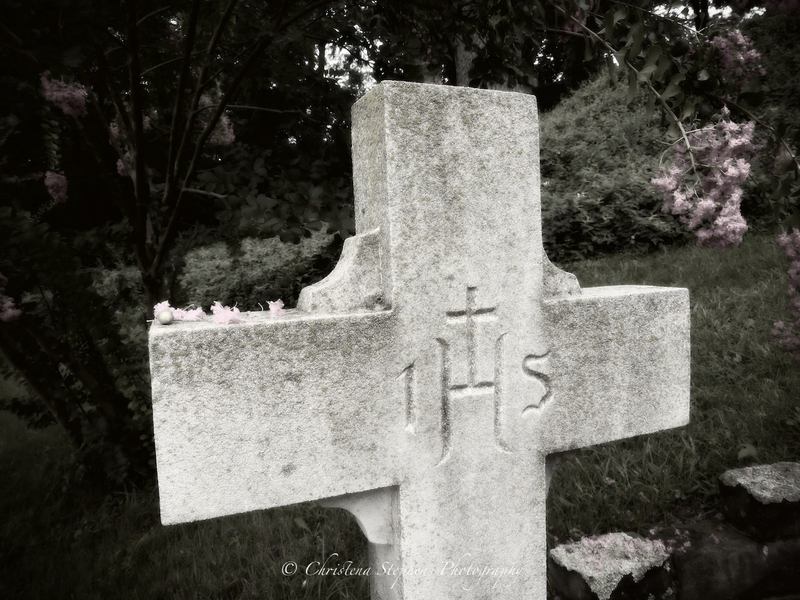 I was searching for one grave in particular Father Conrad Herda’s grave. Herda was the priest who built the cemetery and is one of the priests I have been researching for the Holy Family Church in Nazareth, Texas. Herda experienced persecution during his time at Nazareth due to his German heritage. July days in Arkansas are normally hot and humid, but this day was cool due to the clouds and rain. The grass was wet and thick with every step I made. Taking my time I walked every row of cross tombstones. I never counted how many, but there were a lot. The crepe myrtles were in full bloom around the top row of the graves and gently blew in the soft wind and the rain continued. IHS is the Latin monogram for Jesus Christ. I finally came across Herda’s grave. As I walked that peaceful cemetery I wished I could have met all those priests… who knows maybe some of them were actually with me that day in spirit.